AUTHOR: Alison Freeman, Senior Consultant, NEF Consulting. How we feed an extra two billion people on our little planet by 2050 is one of the seismic challenges of this century. The problem isn’t just about the growing number of mouths. It is about the potential loss of 20% of our arable farm land due in part to soil degradation, a changing climate and water scarcity. What role do women have in driving sustainability? In August I saw first-hand how hunger has already been a daily reality for many living in rural Northern Ghana. As part of our work conducting a Social Cost Benefit Analysis for CARE’s Pathways programme I was able to meet over 200 farmers from communities in the region. They told me how prolonged periods of food shortages were directly related to tired soil, persistent pests, a long dry season and the same crops being farmed season after season. Sadly, the hunger was often worst for women and children. Men, who control family income, are always provided for first. Some say that having more women in politics and leadership roles would solve many of the world’s most pernicious problems. Women are often great mediators, tend to hold more nurturing values and represent a huge untapped economic potential. NEF Consulting’s work has evidenced this time and time again. 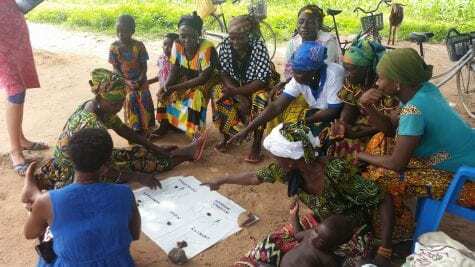 So what happens when you give women a spade in Northern Ghana? Since 2012 the Pathways programme has trained women in sustainable farming techniques: inter-cropping, composting, nitrogen fixing crops, low tillage, reduced run-off and eco-harvest techniques. This has been combined with gender dialogues, market access training and support for village savings groups. The result has been transforming and a real pleasure to witness as an evaluator. It is rare to see beneficiaries so wholeheartedly pleased with an intervention. Environmentally, soils have become richer, more fertile and now support diverse flora. Economically, women and their families’ incomes have leap-frogged and their savings can now see them through difficult periods. Socially, women and men have started to make decisions together. More children (especially girls) are completing school, domestic violence has all but disappeared and everyone feels healthier thanks to better diets. Programmes like Pathways are archetypes for achieving the Sustainable Development Goals. They prove that in solving one crisis, such as hunger, we don’t need to compromise on other societal targets, such as biodiversity, to achieve sufficient yields. During causation exercises participants routinely rated women’s capacity – their unleashed skills, energy and passions – as the most important driver for this programme’s success. This is a truly uplifting signal of the role women will play in building our future sustainable economy. NEF Consulting has been asked by CARE to calculate the overall social value of Pathways across all stakeholders. This includes women and their families, in Ghana, Mali and Malawi. We are currently in the field so watch this space for updates.